House any comfort. Carport, radio CD - TV tapes and dvd player. a horse and two donkeys are waiting for your children for the holidays. Small very rustic house made of wood and stones where you will find calm and rest. 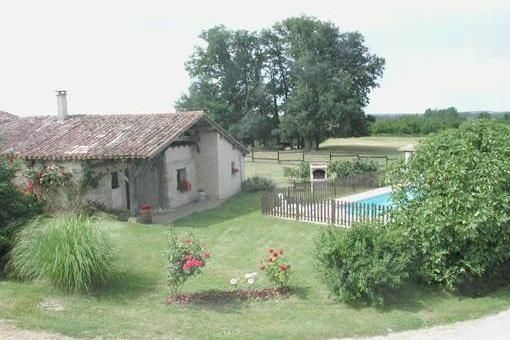 It is surrounded by 13 hectares of organic farmland and is 500 m from the road. The shops are 7 kms from us (intermarché-petrol station) and 3 kms to the village (pharmacy-bakery-office tobacco-post-butcher), further well on Bergerac and Marmande 30 minutes by car. Night markets in the surrounding villages in summer seasons that make you discover their street entertainment and regional meals. A deposit of 300 € will be required upon arrival and will be returned a few days after your departure.